Information and communication technology (ICT) can help farmers become more productive and get better access to market information, financing, and other facilities and services. Photo credit: ADB. 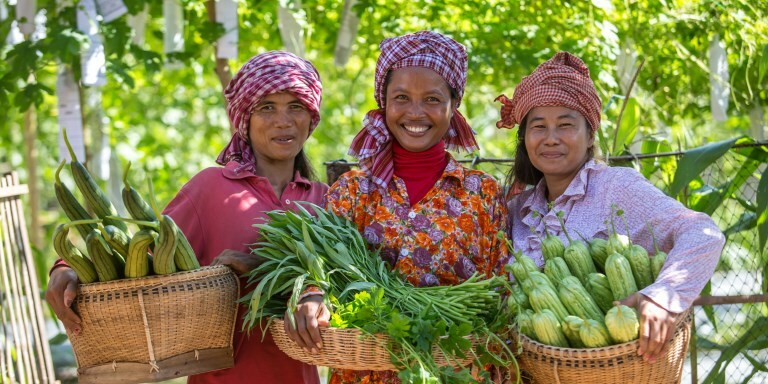 A suite of information and communication technology (ICT) solutions can help integrate farmers in Cambodia into agriculture value chains and boost their competitiveness. Much of Cambodia’s poverty reduction accomplishments relied on the agriculture sector, which recorded exceptional growth in 2004-2012. But agricultural productivity and production in recent years showed signs of slowing. This trend is recorded even in Kampong Cham, a province known as the agriculture center of Cambodia. Home to an increasing number of businesses, Kampong Cham represents the future of Cambodia’s fast-growing economy and industrial and overall societal development. The province has abundant fertile land, farm labor, draft animals, and groundwater resources. It also benefits from a good road network and proximity to Viet Nam, which opens trade opportunities with the net rice exporter. But farmers are facing numerous challenges, including decreasing earnings, higher production cost, and problems in achieving product quality. A recent study shows that an e-agriculture platform can help address the inefficiencies that lead to farmers’ lack of competitiveness. It consists of four components: climate smart agriculture, agribusiness portal, farm credit, and risk management (crop insurance). This is a summary of E-Agriculture Platform for Kampong Cham Province, a study funded by the Asian Development Bank (ADB) under a technical assistance project. The report, led by ADB’s Sustainable Development Team and executed by Ernst and Young LLP (EY) India team, explores the feasibility and application of ICT tools for climate-friendly and inclusive agricultural value chains in Kampong Cham, Cambodia. The line from farmer to end user in Kampong Cham is peppered with various intermediaries that make the process long. The stakeholders in the value chain form an integral part of the system. At each level, the stakeholders play a major role in determination of the price of the commodity. Source: E-Agriculture Platform for Kampong Cham Province—Kingdom of Cambodia. There are very limited post-harvest infrastructure facilities for the farmers. Many of them store their crops in the open. Even the government faces difficulties in undertaking better planning for the sector due to the unavailability of real time on-ground data. Traders use their own channels to determine prices. Farmers are at a disadvantage in terms of their lack of access to reliable market information affecting their produce. The absence of enforcement mechanisms to control the quality of seeds and agro-chemical inputs in the markets affects the quality of produce. Farmers suffer from low liquidity and limited access to formal credit sources. Banking networks are not well established in Kampong Cham. Agriculture accounts for a very small percentage of commercial bank loan portfolios. The lack of effective linkages between stakeholders in the value chain hampers the ability of exporters to meet importer requirements. Moreover, farmers are unaware of global quality requirements in rice trade, for instance. This results in poor knowledge in the use of agricultural inputs, techniques and soil improvement management. Advisory support through various channels of the existing Agricultural Marketing Information Service is insufficient and obsolete. Farmers are exposed to extreme climate conditions (flood, flash flood, and drought) resulting in major crop losses and income uncertainty. A proposed e-agriculture platform – using ICT tools, smart data management and farm management systems – will connect the various stakeholders and help farmers overcome current challenges. The platform will consist of several access channels, such as mobile, kiosk, desktop, call center, radio, and television, among others. The optical fiber network in Cambodia is growing at a rapid pace and most of the national highways are covered by the network. Kampong Cham’s telecom infrastructure is relatively better than the rest of Cambodia with its telecom tower density reasonably good with multiple providers. More than 80% of the farmers use mobile phones and of those 20% use smartphones. High-speed internet is available at affordable rates and social platforms, including Facebook, are widely used to disseminate information. Adopt a climate-smart agriculture approach. This approach will have: (i) advisory and information dissemination which will provide demand-driven and market-oriented information to farmers and other stakeholders; (ii) climate smart precision farming where farms will use IT such as internet of things based sensors, drones, satellite imagery to improve techniques; (iii) soil and mobile rice testing which can assess the health of soil and quality of produce and provide improvement/correction measures; and (iv) traceability system to track product history from production stage till end user reach. Link stakeholders via an agri-business portal. The portal will have an e-market place connecting producers and buyers, which will lessen the need for many intermediaries and enable both producers and buyers to access the same set of market information. It also includes an agri-input e-market, which will facilitate trade of agriculture inputs, such as seeds and planting materials, fertilizers, pesticides and farm equipment. An ICT intervention model will provide farmers information and access to formal sources of credit. This will allow them to avail of low-cost credit directly from financial institutions. It will also allow financial institutions to check the past transactions of the farmers, which the institutions can use to provide differential interest rates. Risk management (crop insurance) will be an ICT intervention model supporting the government’s risk management system and payout program. This is seen to pave the way for the creation of farm insurance products. Asian Development Bank (ADB). Regional: Delivering Knowledge Solutions in Asia and the Pacific. ADB. 2017. E-Agriculture Platform for Kampong Cham Province—Kingdom of Cambodia. Mandaluyong. Arun Ramamurthy designs and implements digital technology solutions and innovations in development economics. His recent work includes piloting connectivity and communications technologies in Bhutan and Myanmar. He is involved in conceptualizing Internet of Things and Artificial Intelligence solutions through ADB interventions in several countries. He was with Tata Consultancy Services in India, and worked in the United States, United Kingdom, and Singapore before joining ADB.